My last post in 2017 was about a failed attempt at flipped mastery and all the changes I was going to make in my class to give it a second chance to work. We are in April and the first term in my academic semester already ended, and all I can say up to this point is…so far, so good. Not only did I manage to fix the bugs my class had last time I tried, but I discovered HyperDocs which not only made flipped mastery possible, but also improved my regular flip. I want to share with you my progress up to this point, and share my thoughts and actions planned for the rest of the semester. I had decided I would offer students a big picture of the grammar structures to work on during the term for them to work independently. I had also thought about walking students through the process and not letting them astray in the process of learning grammar (as I did during the first attempt). Thinking about how to achieve those two goals and browsing alternatives, I found HyperDocs. According to Lisa Highfill (@llhighfill), Kelly Hilton (@kellyihilton) and Sarah Landis (@sarahlandis), the writers of “The HyperDoc Handbook: Digital Lesson Design Using Google Apps”, HyperDocs are “transformative, interactive Google Docs that replace the standard worksheet method of delivering instruction” (L. 67) and are very useful to implement flipped mastery because “a HyperDoc shifts the focus from teacher-led lectures to student-driven, inquiry-based learning allowing students to actually learn through exploration” (L. 76). I finally seemed to have found my way through flipped mastery. I started to read everything I could and look for other implementations of HyperDocs for flipping. I came across Susan White, (@swhiteCMS) who has also spoken of HyperDocs as effective tools for differentiating instruction while flipping (if you want to learn more about innovative ways to differentiate and Susan’s work, check out this course). I also, read The HyperDoc Handbook and I have been coming up with my own conclusions and tips. Now, I will like to share a few important thoughts I’ve collected up to this point. When creating HyperDocs, you can use different instructional design models. Regardless of the model you decide to follow, what really matters is to keep in mind that the purpose of using HyperDocs is to achieve deeper levels of learning and to make learning as meaningful as possible for our students. Anyway, I decided to adopt the model provided by Highfill, Hilton and Landis because I’ve found out that those steps make for a very complete exploration of a topic, and because as my goal to use them was to facilitate mastery learning, the more students spend on a topic and the deeper the levels of thinking used to explore, the better they will internalize the concepts. 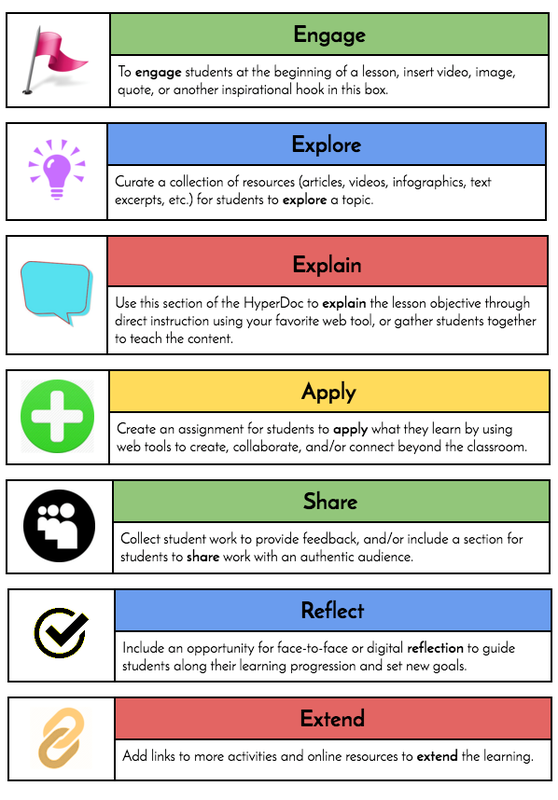 Thinking of the different sections of the HyperDoc hasn’t always been easy, so the creation process takes me a few days. But, planning these tools has really made me think deeply about how to create the best learning experience for my students, and this has also resulted in a very thorough treatment of every grammar structure guaranteeing learning and internalization. I try to have my students profit as much as possible from the HyperDoc, so, I plan it for a week of independent work. As my class is flipped, this is the out-of-class work my students do for the grammar component of the class. Here’s what I have done for each one of the stages in Figure 1. Engage: as I am the class clown, I usually try to find a grammar joke on Google and start there. However, one of my HyperDocs (the one about gerunds and infinitives -add link) started with a series of songs that feature the different forms. Explore: Luckily, YouTube is full of videos of teachers explaining grammar structures. I have used a few of these! I’ve also used sites like Newsela combined with Insert Learning (awesome combination, by the way!) In order to expose students to the grammar topic in context. However, it’s not always easy to find this type of authentic resource featuring a particular grammar structure in context. Anyway, I have a confession to make, I always struggle with the difference between Explore and Explain when dealing with grammar, because I have found different video explanations to be suitable for this part of the HyperDoc. What would you do? Explain: This part is easy because it asks for the direct instruction. So, it’s the “flipped” content of the lesson which, in my case, is the grammar explanation of the topic. I use part of the material generated by my students in 2016-2 where they “taught” the grammar of the course as part of my flipped learning project. They prepared videos using powerpoint or emaze and screencast-o-matic. So, I’m using those videos (with their consent) and enhancing them with questions added via Edpuzzle. Apply: in this part of the HyperDoc, I have my students do the more traditional grammar drills they are used to. I take them to different websites like ego4u.com, and others. They normally do controlled grammar exercises here. Just to make sure the grammar structure really sinks in. Share: This stage is where most of the fun happens! Here is where I take students out of their comfort zone and I ask them to really show mastery of the grammar structure. They have to apply the grammar structures to more communicative situations like writing letters, providing opinions in a conversation, argumenting thoughts, etc. I normally collect the information in this stage via collaborative websites like Flipgrid, Voicethread, our Coursesites discussion board, etc. Reflect: in this stage the authors of the HyperDoc Handbook suggest reflecting about the learning achieved through the HyperDoc, but also providing feedback to the teacher. I have done both. I normally use Padlet to have students reflect about their learning of a given topic. Sometimes, I even collect paper-based feedback. You can see a sample Grammar HyperDoc here. I need to say that even though the authors of the Handbook mostly suggest packaging the contents for the HyperDoc using the Google Suite of tools, I’ve experimented packaging them in ThingLink and DeckToys. I still have to collect data about students’ favorites. Results coming soon. For the in-class portion of the lesson, we have “Grammar Days” every Tuesday. Students are supposed to work on their HyperDoc independently from Wednesday to Monday (making sure they always have a weekend to really internalize the concepts and have plenty of time to do the required activities). On the Grammar Day, I normally set up an in-class flip (I do mix it all, don’t I? ), So that students can work in stations. that provide different types of practice bearing in mind Bloom’s taxonomy (more on planning in an upcoming blog post). During grammar day I also do informal mastery checks by interviewing students randomly and asking them questions that evidence grammar mastery. Last semester, my biggest mistake was assuming that just by giving grammar videos to my students was going to do the trick. I assumed they would magically know what to do with those videos, how to self-regulate and how to learn, but after reflecting a lot, I learned they needed more focus and guidance to achieve the autonomy I wanted. HyperDocs help me to provide that guidance without being at the center of the class, but still being available enough for students to succeed when working independently. HyperDocs helped me build the path to self-regulation I needed for my students to really master the topics in our course at their own pace. Another reason to say that HyperDocs facilitate flipped mastery in my class is the level of depth I can achieve with a HD thanks to its design principles. Students can go deeply in learning a topic because there are multiple tasks for them to perform, and I embed diverse ways to show mastery. I insert links to FlipGrid prompts, VoiceThread Discussions, Reflections, compositions, grammar exercises, video making, etc. And so students really dig the topics deeply. Last but not least, HyperDocs have made grammar fun in my class increasing student engagement, thus maintaining interest. When students are interested and engaged, they look further and learn more. They have started to see grammar differently and to want to know more about how language works in order to own it. In this way, students have achieved a higher level of mastery of those grammar structures. I already have the HyperDocs for two more units/weeks ready. I also plan to collect some formal data about students’ perceptions related to HyperDocs in order to make instructional design decisions for upcoming units and HyperDocs. Also, I’m asking them about their preferences regarding tools and packaging. I really want to know what my students find more useful and appealing in order to cater for their interests with my design. I still have to do some formal summative assessments for the flipped mastery to be fully applied. I just struggle very much with designing those assessments since I haven’t been able to.think of summative assessments that are easy and fast to grade and evidence the mastery of a grammar structure. Any ideas? So, my advice in a nutshell? HyperDocs work! They take some time to make, but they strengthen learning and the flipped approach noticeably. Try them out! Go check HyperDoc.co and browse templates and samples. You don’t have to start from scratch if you don’t want to. Don’t be afraid to mix it all up. You see? I’m doing flipped mastery with HyperDocs and In-class flip. And it’s fun! More on this topic coming up soon enough. *I dedicate this blog post to my dear Laura Vacca for listening intently to my crazy rants about how excited I am about implementing HyperDocs and for her valuable ideas and perspective. I also want to publicly thank her for her help recording videos and taking pictures for this post. **I provide links to different sites as a way to illustrate and give examples. I don’t receive any payment for doing so, it is just to share.